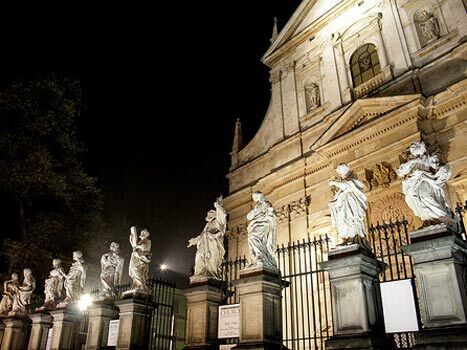 Even respected Polish art historians confess that they have not visited all of Cracow's churches. There really are a lot of them. So rather than trawling through every last baroque belter, we thought we'd single out some of the most interesting relics of each era, from subterranean chapels to Art Nouveau wonders. Crucially, church-building remains very much alive here today - the bold modernist church of Lagiewniki (2002) sees some two million pilgrims a year, many of them from as far afield as Latin America. The power of the Catholic Church has dipped a little since its extraordinary zenith during the 1980s (when the Polish Pope soared high with the Solidarity protest movement) yet religion is still an integral part of the lives of the majority of Poles. For any pilgrim or culture vulture making a trip to Cracow, the most obvious starting points are Wawel Cathedral and St. Mary's Church, the two most historic houses of worship in the city. Both are must sees, although the Cathedral is more remarkable for its status as a vessel of the nation's history - virtually every king and national hero is entombed here - than for its architectural cohesion. Nevertheless, some of the chapels are exquisite, not least that of the Holy Cross, with Veit Stoss's magical tomb for King Kazimierz Jagiellonczyk and Jozef Mehoffer's Art Nouveau windows. Stoss also provided the centre-piece for the Church of St. Mary's - his altar-piece there is a marvel in itself. Poland has been a Christian nation for over a thousand years, and a chapel from the pre-Romanesque era can still be found in the grounds of Wawel Castle. Cracow, which became an archbishopric in 1000, and Royal Capital thirty-eight years later, has been a pilgrimage destination since time immemorial. This factor was accelerated by the martyrdom of Poland's first Saint, Stanislaw Szczepanow (1069), who was butchered at the Church on the Rock (rebuilt many times) in a scenario that mirrored the murder of the English Saint Thomas a' Beckett. The Tatar hordes laid waste to Cracow in 1256, but there are still traces of Cracow's Romanesque past in the city, both in St. Leonard's Crypt at Wawel, the church of St. Andrew's on the Royal Way and St. Adalbert's on the Market Square. A fine example of Cracow Gothic can be found down in Kazimierz at St. Catherine's, whilst nearby Corpus Christi has an extraordinarily moody atmosphere. If you get the chance, it's well worth climbing up the tower of St. Mary's. Meanwhile, the Church of the Holy Cross mirrors the wondrous wooden churches that still dot the region (with the added novelty of a single nave with a column that unfurls like a palm tree). If you're keen to see something else that you won't find in the West, head for the wooden Gothic church at Mogila, linked to Cracow by bus and tram (best on Sunday). Architectural enthusiasts will have plenty to digest here as the famed Cistercian baroque monastery lies opposite, and a fascinating communist ideal city turned up next door in 1948 (more of which later). The only pure Renaissance edifice in Cracow is the Sigismund Chapel in Wawel Cathedral - reputed to be the finest outside Italy - whilst the remodelled courtyard of the castle started a craze amongst the nobility, many of whom spent time at Italian universities. Capital status was bestowed on Warsaw in 1596, but at first this did little to diminish the grandeur of Cracow. The baroque style is ubiquitous, and Cracow's reputation as 'a second Rome' continued to grow. The boldest baroque church is that of St. Anne's, but hidden gems such as The Visitation ('Wizytek', Plac Biskupia) are also worth rooting out. Intrepid explorers might leave the city behind and head for Bielany, one of the few Camaldolese hermitages left in the world. However, women are only admitted on special feast days. The baroque splendours of both the magnates and the Church belied the fact that Poland was in decline. This was exacerbated by a series of crippling wars. Revival came too late and Poland was finally wiped off the map in 1795. Cracow remained a semi-free city for some of the nineteenth century, but it was a pretty miserable and decrepit place. The Austrians took over in 1846, whilst in 1850 fire wreaked havoc in the centre of the Old Town. Nevertheless, a renaissance was on its way. The Habsburgs had a rocky ride in their wars with the Prussians, and one of the upshots of this was autonomy for the provinces. Galicia, the predominantly Polish province, had a free rein as of 1870. The Poles soon led the way in Galicia and there was even a Polish Prime Minister in Vienna before the century was out. Cracow may have been only the second city of the province (Lemberg, Lwow in Polish, was the capital) but Cracow soon became the spiritual capital again, aided by its royal legacy and the revitalized Jagiellonian University. The period 1870-1914 saw all kinds of regenerative projects, including the remodelling of the Cloth Hall, the return to Poland of the Czartoryski Museum, the renovation of the Old Theatre and the construction of the Slowacki Theatre to name but a few. The most extraordinary ecclesiastical novelty of this era was the boldly original interior of the Franciscan Church, which had been gutted by fire. Stanislaw Wyspianski rose to the challenge and created one of Poland's most memorable church interiors. The First World War stalled many projects, but in its aftermath Poland regained her independence. The Art Deco style was enthusiastically embraced and Poland swept the board at Paris's famous Exposition Internationale des Arts Decoratifs of 1925. The two main architects of the Polish Pavilion were Jozef Czajkowski and Jan Szczepkowski, and the project included an exquisite chapel by the latter. The pavilion was never reconstructed on Polish soil but the art deco style can be seen at several Cracovian churches, including Sw. Szczepana and Sw. Stanislaw Kostka in Debniki. The Second World War saw the loss of a huge portion of Poland's cultural heritage and the human toll was unprecedented. In some respects, Poland is still recovering from the catastrophe. Somewhat exceptionally, Cracow was spared much of the devastation that so many other Polish cities suffered. However, the Soviet-backed Communist party that was levered into power by the Russians was hardly a friend of the Church. The period 1948-56 is commonly described as one of virtual war between the Church and the State. However, whilst the majority of the Church's property was confiscated, the institution survived. Under the aegis of a number of inspired men of the cloth, including the cardinals Adam Sapieha, Stefan Wyszynski and, ultimately, Karol Wojtyla (Pope John Paul II) the Church managed to play the role of shepherd of the nation through this trying era. The building of the Arka Church in Nowa Huta has since passed into legend. When Poland regained full sovereignty in 1989, the Church was amongst the quickest to reclaim pre-war property - some felt that it was rather over-zealous in this matter. Regardless of this, new building has continued at an extraordinary rate. It has been claimed that more new churches have been built in Poland since 1976 than in the rest of the world put together. The most famous new house of worship in Cracow is the Basilica of Divine Mercy at Lagiewniki, which was consecrated by Pope John Paul II in 2002. The sanctuary is a focus for the cult of Saint Faustyna, who resided in the old convent before the war. The sleek tower that adjoins the new church is reminiscent of a knight's helmet, and it affords a stunning view over the city. Cracow's churches are invariably at their most striking during Mass, when music and incense raise the atmosphere. It's during these times that the buildings really come alive. Although shorts and cameras won't get a warm reception, no one will mind if a respectful visitor joins the stalls during mass. On a different note, travellers will also find the carved chapels at Wieliczka salt mines interesting, the most recent of which was carved by a group of miners a hundred years ago. Better still, head south from Krakow and discover the old wooden churches of Debno, Harklowa and Grywald. These count amongst Poland's most distinctive treasures. Lastly, sacral architecture was never restricted to the Roman Catholic Church during Poland's Golden Age. Throughout the 15th and 16th centuries, Poland represented the most tolerant state in Europe. Armenian Catholic, Greek Catholic, Mosaic, Karaite and Muslim prayer houses can still be discovered across the ancient Polish lands, some still functioning until this day. To Diane Wheat: Slim chance of relationship. My ancestors came from woj. Kujawsko-Pomorskie, pow. Znin, which is about 215 miles nnw of Krakow. Thanks for this - will certainly help me find my feet. Looks like there's lots to see! I am very pleased I found this site.in txo days I leave for Krakow to spend the New Year.I enjoyed reding about the city and I think it made all more interesting to visit (especially the churches).I wonder if I will find tickets for the New Year's concert at the Philarmonic Hall,I sure hope so. Happy New Year to all those who visit this site and krakov! This note is to Daniel Drzewiecki. My family name is Drzewiecki. They settled in Chicago, Illinois. I live in Phoenix, Arizona. My grndfather's name was Walter and he was from Krakow. Maybe we're related. Very nice historical account of Cracow's churches. Was there in 1999 and stayed at the Hotel Saski. Was in St. Andrew's Church during devotions and sang hymns that were printed on cards lying in the pews. Couldn't get in St. Anne's Church. It was so full, people were outside the door trying to hear mass. Pope John-Paul II reporteldly had a fall and spent the night in a hospital. At Koscoiol Mariacki there was a wedding in progress. When the ceremony was over the bride and groom exited the church and right outside the door stood a panhandler with his hand out. That was on June 19, 1999. Dziekuje, Bog zaplac!